Once a friend had a terrible fight with her boyfriend and he sent her flowers to apologize. Unfortunately, the flowers he sent were carnations. Still furious, she called him and said, "I got 'em and they're unacceptable." He heard that as, I got them and they seem to have wilted significantly in the trip over. So he called the florist and demanded that they send over another bouquet - of carnations. Just last week, a friend mentioned that her boyfriend - in a couple exponentially sweet maneuvers - had brought her roses. Amazing in concept, but she kind of hates roses. If a guy goes and picks wild-looking roses from his grandmother's garden and sticks them in a vintage tea pot -- a gal will probably love them to bits (and will eventually realize that she's been dating a gay man). But short of that, we don't really desire them (and we certainly don't desire carnations). We want a flower that's as individual an un-ordinary as we think we are! This was a very roundabout way of saying, that while the plants aren't that fantastic, the scent of rose can be wonderful to have around. Porter and I picked up this Savon Rose de Marseilles soap the other day and it's filling the bathroom with wafts of heaven-like femininity. That combined with the scent of Davines Love shampoo has made the commode the most romantic-smelling room in the apartment. That is a fantastic package for a rose! My boyfriend once got me one of the crates of roses that Spruce puts together. I loved it, but had it been a bouquet, I'm not sure our relationship would have lasted long. Ohh nooo... I have to disagree! I used to work at a florist and really came to LOVE carnations. Over the years I have decided that flowers are like wine - there aren't any bad ones, just all appropriate for different occasions. Besides - Like you said, it depends so much on how they have been put together. I once had an awesome bride who had tightly arranged fluffy balls of carnations for her bridal party with little succulents surrounding them - kind of hard to imagine - but indredibly cool! For some men, going into a florist at all is such a strange and daunting experience I wished I could have told their girlfriends how much agonising effort went in to buying that single red rose! How fickle and petty! The solution, of course, is for these poor guys to give their woman nothing. Or better yet, they should find other young ladies who appreciate them. Ungrateful American b*tches. Such wisdom! Every straight man in America should be read this blog post as a rite of passage - before he's old enough to drive - or date. I love a whiff of the rose smell! A wonderful client of mine always had her home smelling of rose. It so fit her, small petite, blonde, and light skin with blue eyes. Every time I smell rose, I think of her. I use Davines Love, too, and adore the scent. I want that nice square soap now as well, since I am picky about smells, if we both enjoy the Davines the this block passes the test. I love roses. what can I tell ya? 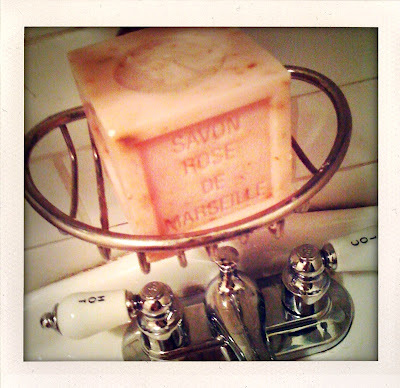 I have a bottle of Savon De Marseille and it's actually made in china. Peggy Olson - "a basket full of kisses"
Don paraphrase - "Every woman wants choices but in the end none wants to be one in a hundred in a box. You're unique, you make the choices.......you tell the world he's mine..."